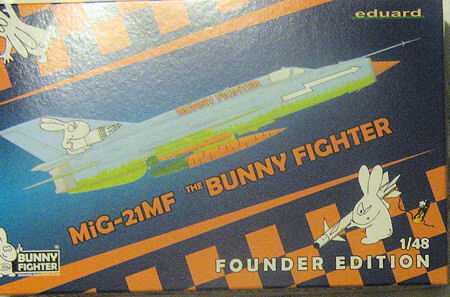 When the Bunny Fighter Club (from here referred to as BFC) was first listed by Eduard I knew I had to get on board. The idea of an exclusive club membership that offered a lifetime discount and other perks (both stated and forthcoming) was too good to pass up. Plus I admit that I have ways gotten a kick out of the E-Bunny’s in Eduard’s monthly digital magazine. Limited to 1,000 pieces for charter memberships you want to get on board with this one much sooner rather than later. So, what exactly do you get for your money? Let’s find out! Upon opening the very uniquely printed box you are presented with four bags containing seven sprues that are clear, orange and blue in color. 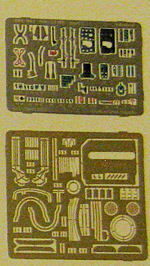 The sprues themselves are what you will find in the standard-release Eduard MiG-21MF kit. Also included is a ziploc bag crammed with Brassin resin. This includes a complete cockpit, main wheels and UB-16 rocket launchers. 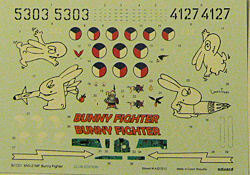 You also have two photo-etch frets for the MF version, canopy masks and a very nice if not unique decal sheet with three options, one of which is for the spurious BFC ‘Carrot Flight’ with the remaining two options being for Czech MiG-21MFs from 191 that were each adorned with the Eduard ‘knight’ logo/symbol. Decals are very high quality and should be on par with Eduard decals in their current and past kits. Adding to this is a blue Founder BFC t-shirt, ordered to the size you specify, that has a humorous image of the E-Bunny’s on front and with a unique QR code and bar code. These are to be scanned at any event you attend where Eduard is present for additional discounts and perks. Cool! Quality of the material is excellent as it’s made by Fruit of The Loom and the image on the front is of heavy-duty screening and should hold up very well. Note that the t-shirt was only available to charter members…once these 1,000 membership packages are gone, they are GONE. 15% off (nearly) all Eduard products ordered from the Eduard Store (website). This is a LIFTETIME discount…think about that for a minute. Each BFC charter member is assigned their own unique BFC membership number. And no I am not telling you what mine is! Kits and items unique and available ONLY to BFC members. Already there are four kits listed for this! Lower prices at Eduard merchandise stands at shows. Loyalty price bonuses. For each purchase at the Eduard Store (website) you will be credited a loyalty bonus that can be accumulated and used for further discounts. Free entry to the E-Day show. For those of us that live outside of Europe this might seem like a bit of a ‘who cares’ kind of benefit. But I for one would plan a trip overseas around the show just for the chance to go…and a free entry is more money to spend on more stuff! Also, Eduard has hinted that there may be yet be even more benefits forthcoming. So, for $74.95 is this membership package really worth the money? Well, let’s see…the Profipack kit lists for $40 and the Brassin resin goodies are about another $30+. Then there are the very unique decal options, the t-shirt ($15-20 value perhaps?) and then all of the perks unique to the BFC club. And that 15% discount at the Eduard Store, over years of use, will pay for this membership sooner than you think. It was not a cheap buy-in (shoot, I sold kits off to get mine) but once you think about it you can see the long-term value. Overall a very eye-catching package and regardless of what version you build you will have a superlative MiG-21MF on your shelf. As of this writing there are less than 100 memberships left. I highly recommend that you get on board while you can especially if something fun, unique and with a high return on value appeals to you!